Selectable objects like buttons have a “Navigation” property. By default, this is set to Automatic, which again, does the right thing in most cases. Unity uses each object’s position to determine which object will be selected when navigating up, down, left, or right. 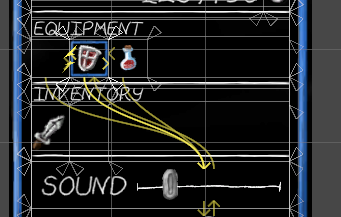 This is basically how controller navigation works: you’re building a large chain of objects, which can connect to up to 4 other objects. Helpfully, there’s a “Visualize” button which overlays yellow arrows indicating these connectors. None: Turns off navigation entirely. Vertical and Horizontal: Works like Automatic, but limits navigation to horizontal or vertical connections. Explicit: As shown above, allows you to explicitly set the objects that are selected on up, down, left, and right navigation. Explicit requires a bit of micromanagement, so it’s best to use it only if one of the other options doesn’t give you what you want. It’s also (as we’ll see) something you can manipulate in scripts, which is helpful for generating menus on-the-fly or swapping behaviors. The Selectable class (the basis for several Unity UI components, and something you can inherit from for your own components) defines SetNavigationType, SetUp, SetDown, SetLeft, and SetRight methods for changing navigation properties. Another bit of Unity UI magic I took advantage of was the collection of selectable interfaces, specifically ISelectHandler, IDeselectHandler, and ICancelHandler. ISelectHandler fires OnSelect if a Selectable object attached to the same game object receives focus. IDeselectHandler fires OnDeselect if a Selectable object attached to the same game object loses focus. ICancelHandler fires OnCancel if a Selectable object attached to the same game object is selected, and the user presses the “Cancel” button. All of these methods accept a single “event data” parameter, which may be a different subclass depending on where it’s used. Depending on what you’re doing, you may need to call its Use() method to get correct behavior. This signals to Unity that you’re handling the event in your code, rather than relying on Unity’s default behavior. My Equipment submenu is implemented as a Submenu “container” class which contains multiple SubmenuItem objects. The Submenu itself isn’t Selectable; it’s simply a manager for the items which are defined in the component. The Submenu also knows a few other things, such as which items are “previous” and “next” for the submenu, and what the currently selected item is. For example, my submenu above knows that it’s the first item in the vertical list and is followed by the Sound slider. It works a little like the old PlayStation system menu, except rotated π/2 radians. The code’s a little complex (partially because I tried to abstract it enough to be reusable), so if you want to follow along, it’s at https://bitbucket.org/snippets/dylanwolf/5ex9Ea. I set the explicit left navigation property (SetLeft method) on the subitem to point to the previous item in the list (if there was one), and modify the explicit right navigation property (SetRight method) on that item to point back. Once this initialization runs, I can navigate within the submenu as well as out of the submenu, but I can’t navigate into the submenu. Updates the navigation of the “Previous” and “Next” objects to point to the selected item (in this case, calling the SetUp property of the Sound slider to navigate to the selected equipment icon). On deselection, the submenu item changes the button image to a “grayed out” inactive image. 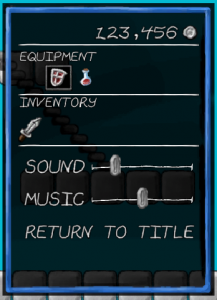 This way, the player can see which item is selected, but knows the focus is elsewhere in the menu. I didn’t actually need to write any code to get the volume sliders to work right with controller navigation. Setting only the slider’s up and down navigation properties leaves left and right available to adjust the value when it’s selected. However, I don’t want the player to have to click the slider to select it; I’d like to allow the player to click anywhere in the “Sound” or “Music” block. I apply this to the parent UI element that contains both the “Sound” or “Music” label, the selection frame, and one slider. When anything in that area is clicked, it passes the selection down to the slider. This is another problem that wouldn’t happen with a controller, but becomes an issue if a mouse or touchscreen is involved. Unity’s default behavior is to clear selection when the player clicks outside of a Selectable object. Normally this is expected (it’s not fundamentally different from how most Windows applications behave), but in a controller-only game, recovering from a stray click could feel jarring. It’s not hard to prevent this by adding the following component, which remembers the last selected object and forces the Event system to reset it if it ever becomes null. Because I’m deactivating the entire “in-game menu” object tree when the menu closes and gameplay resumes, I don’t have to add any extra logic. When the menu is closed, the script isn’t running; when it is, no other Selectable UI elements should be active. This tells Unity to call my game engine code and change the current mode; it also tells Unity to stop any additional processing it might do in response to a “cancel” message. Unfortunately, I don’t think there’s a global cancel handler; OnCancel is only called on the selected object when Esc is pressed. To work as expected, every object in my menu with a Selectable component has to implement this handler. This entry was posted in Programming and tagged gamedev, Unity by Dylan Wolf. Bookmark the permalink.